Thursday afternoon, May 17, the Mets came back to defeat the Cubs, 6-5, after entering the ninth inning down 5-1. 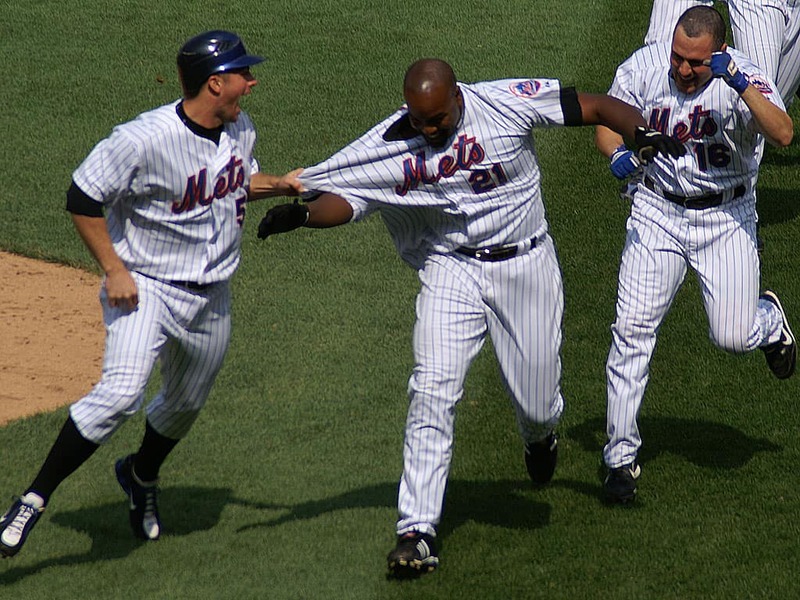 The slumping Carlos Delgado (center) delivered the game-winning single through the right side of the infield, sparking the celebration. David Wright (left) and Paul Lo Duca carried on after Delgado thought he had escaped from the scrum. It really is a great shot. The way Wright is tugging on Delgado’s jersey and Lo Duca is celebrating with a fist pump, the fact that it’s a day game on a bright sunny day — it’s a reminder that these guys are grown-ups playing a kids’ game and sometimes the moment lets them act like kids. Plus, you’ve got Wright, Delgado and Lo Duca — three of the team’s biggest stars all in one shot. And that the photo was taken from the stands — where anyone could have taken it — rather than the photo wells reserved for the pros also adds to the photo’s allure — like the photog is an amateur the same way these players once were. The photo captures the thrill of coming back from a 5-1 deficit in the bottom of the ninth — the kind of win reserved for a team that’s having a special season. A day game on May 17 may not mean much over 162 games, but if this ultimately is the Mets’ year (I will not admit that it might be) and if David Halberstam were around to chronicle The Summer of Oh-Seven, this photo — of pure kid-type joy displayed by three of the team’s stars — is the one you’d expect to see on the dust jacket of Halberstam’s book. As Mets fans, we can only hope that the Summer of Oh-Seven produces dozens of memories like this one, all the way into the final week of October. Though not into November. Mets in six.